Contemporary Concepts of Condensed Matter Science is a series that is dedicated to clear expositions of the experimental, theoretical and computational developments at the advancing frontiers of condensed matter science. Its goal is to provide readers with intuitively clear discussions of the underlying concepts and insights that are the ""driving force"" for the key advances in the field where there are no sharp boundaries between condensed matter physics, condensed matter chemistry, material science and biomolecular science. For more information about the series or to submit a proposal, please contact the Series Editor or the Acquisitions Editor, Susan Dennis at susan.dennis@elsevier.com. 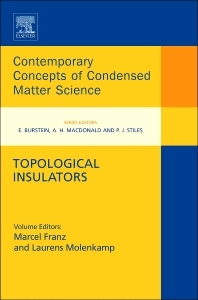 Topological Insulators, volume six in the Contemporary Concepts of Condensed Matter Series, describes the recent revolution in condensed matter physics that occurred in our understanding of crystalline solids. The book chronicles the work done worldwide that led to these discoveries and provides the reader with a comprehensive overview of the field. Starting in 2004, theorists began to explore the effect of topology on the physics of band insulators, a field previously considered well understood. However, the inclusion of topology brings key new elements into this old field. Whereas it was thought that all band insulators are essentially equivalent, the new theory predicts two distinct classes of band insulators in two spatial dimensions and 16 classes in three dimensions. These "topological" insulators exhibit a host of unusual physical properties, including topologically protected gapless surface states and exotic electromagnetic response, previously thought impossible in such systems. Within a short time, this new state of quantum matter, topological insulators, has been discovered experimentally both in 2D thin film structures and in 3D crystals and alloys. It appears that topological insulators are quite common in nature, and there are dozens of confirmed substances that exhibit this behavior. Theoretical and experimental studies of these materials are ongoing with the goal of attaining the fundamental understanding and exploiting them in future practical applications.